Every time it seems as if the western genre has ridden off into the sunset for good, either a brutal tale of revenge or a depiction of survival in the desolate frontier reminds one that there's still some untapped potential there, even if they're simply modern updates of classic ideas. While a few of those sneak out of the high-dollar Hollywood woodwork on the steam of talents such as Tarantino or the Coen Bros., most of the successful examples are skeleton-budget indies from all over the globe, and typically they fly under the radar for a spell before they're discovered. The hope in viewing The Dark Valley is that another to-the-bone genre pic might have emerged from a tale of vengeance and liberation in a harsh, snow-capped landscape, with an up-and-coming character actor taking the reins. While attractively made and occasionally violent in Sam Riley's surroundings, there's too little of consequence to justify the nearly two-hour length, instead suggesting that the well's once again run dry. Riley stars as Greider, a mysterious stranger who rides into an isolated, punishing township in the Alps , whose purpose for visiting seems to be photography the scenery and its inhabitants. Finding himself in the lodging of a recent widower and her daughter with plans for staying throughout the winter, Greider acclimates himself to how the area operates, namely the heavy and dour manner in which an old man, Brenner, and his six sons lord over the people of the area. Their barbaric strong-arm methods give them leeway to act largely as they please, to which they frequently take advantage of the situation, going so far as to enforce archaic medieval laws in their practices -- even influencing the upcoming marriage between the widow's daughter and a local boy. Brenner's seemingly invincible control over the land comes to a stand-still, though, when one of the brothers is discovered murdered in the forest. Suspicion naturally falls on the mysterious stranger; unsurprisingly, Greider responds accordingly. While westerns, especially those fueled by revenge-seeking, typically don't have a lot of plot propelling them forward to their shootouts and orchestrated killings, The Dark Valley suffers more from the negative effects of this than other recent genre flicks, largely due to its length. 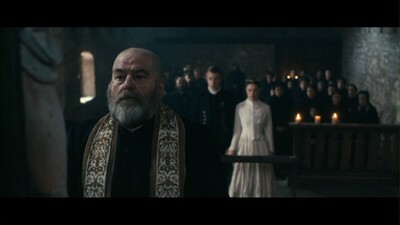 Instead of crafting a tightly-paced and hard-hitting tale of vengeance, director Andreas Prochaska aims to capture the full breadth of the frozen landscape and the burdened gazes of the villagers, conveying the hopeless isolation of the area through slow icy visuals as the valley's darker days approach. He fills the time with unhurried stretches across the white horizon and through the frigid dwellings, and while those deliberate touches of atmosphere might please the senses, they spread the already skeletal plot unjustifiably thin. There's not a lot to contemplate about Greider's psyche or the dynamics of the community during those protracted sequences, rendering eye-catching moments that are unsuccessful at elevating the dramatic tension. Frankly, there isn't a whole lot to the mysterious stranger's personality in The Dark Valley at all, despite Sam Riley's grim performance working to suggest otherwise. Granted, there is more to Greiner's backstory than the lion's share of the film cares to reveal, harboring unsurprising revelations about his arrival in the township, yet there's only so much character development that can happen through Riley's despondent eyes and noble temperament. Like this, he's little more than a distillation of the traits typically found in other enigmatic "nameless" characters of his ilk, from his platonic relationship with the young bride-to-be to his pacifistic response to the Brenner boys' harassment, and it feels like a missed opportunity at something stronger once his identity gets expanded upon through obligatory flashback sequences. Riley's character has the chance to embody an almost mythical persona, yet the film's so adamant about keeping his identity a poorly-hidden secret that it gets lost in a willfully unknowable fog. Taking the revenge-western merits on their own as Greiner's motivation begins to surface, The Dark Valley plays out about as expected, no better or worse, with compulsory bursts of hard violence and invigorated gunplay than enliven the later acts. Regrettably, it also pulls unconvincing punches in the same way that less-credible examples of the genre have done since Hollywood's early days, more interested in saving shootouts for later dates and giving characters the chance to live than staying true to the knee-jerk bloodlust they've displayed earlier. If there was more of a point behind Greiner's agenda -- essentially mirroring William Wallace's reasons for angst in Braveheart, minus the patriotism -- then some of those decisions to prolong the demise of those involved might be welcomed, perhaps even justifiable by suggesting that they're playing the situation safe. Director Andreas Prochaska may have orchestrated a credible setting and fleeting moments of tense brutality, but he leaves one yearning for more purpose and distinctiveness, anything more amid its extended length, within a genre that constantly struggles to stay relevant. Icy blues, fresh whites, and filthy greens and browns dominate the palette for The Dark Valley, providing more challenges within the cluttered wood homes and dense, snowy forests than one might expect. Film Movement's 2.35:1-framed, 16x9-enhanced transfer is up to the task, though, sporting deep but conscious black levels that never detract from details looking in the shadows. The frigid gradient of blues in the snowy forests project solid, reputable shades and convincing white balance, though the dense branches and textures occasionally sport some unavoidable compression noise. A few fine textures can be spotted in wood grains and weathered clothing, while the flickering of lanterns create some unique opportunities for warmer color fluctuations. Skin tones are reputable and appropriately balanced depending on the scene's visual tempo, and there's no discernible edge enhancement or distortion. Film Movement's DVD defaults to an English 2.0 dub for The Dark Valley, which does a disservice to the accurate options made available for the film. The original German language track is available in both 2-channel and 5.1 Dolby Digital offerings, though there's not a lot to the surround options made available. Like some of the label's other releases, these sound as if they're essentially stereo tracks that have been nudged into a full surround design, where both atmospheric sounds and voices are bluntly conveyed through both their respective front and rear channels. That said, there's a lot to admire in The Dark Valley's audio quality, from a natural grasp on the German dialect -- most of which is delivered through weathered accents -- to the pops of rifles and the rustling of wind. The optional English subtitles are eloquent and mindful of the necessary reading times. An English 5.1 dub is also available. Along with a batch of three Deleted Scenes, Bios, and a Theatrical Trailer (1:25, 16x9), Film Movement have also included a lengthy, comprehensive Behind the Scenes (43:23, 16x9) look at the making of The Dark Valley. Director Andreas Prochaska, actor Sam Riley, and other producers behind the film gradually dissect the elements that went into making the film, from adapting the source novel with the hopes of adding something new to Riley's motivation behind playing a Clint Eastwood type of character. A few split-screen sequences show off storyboards and the final scenes from the film, while a lot of discussion gets poured into selecting setting and adapting the production design to specific scenes' needs, especially involving makeup. Some insight into the film's music rounds out the making-of feature, capped off with a few minutes of raw behind-the-scenes footage. A brilliant short entitled The Gunfighter (8:45, 16x9) can also be found on Film Movement's disc, which includes terrific voice-over work from Nick Offerman wrapped around a hilarious premise that's more innovative than the main feature. 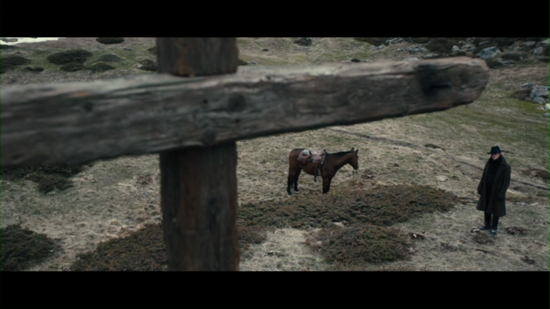 Somewhere in The Dark Valley lies a reputable revenge western that's about twenty minutes shorter and more thematically relevant than what appears on-screen in director Andreas Prochaska's film. It's not a bad example of the genre, at all, with punchy shootouts and a bloodthirsty streak of retribution, but its unjustified pacing and been-there, done-that plotting leaves one anxious and expecting more. 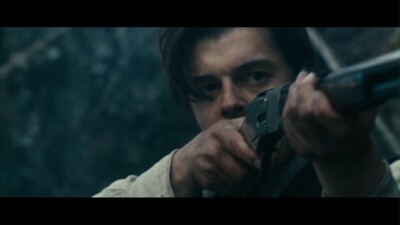 Sam Riley could have almost made a mythical character out of Greiner if he had stronger material to work with, but his fierce gazes and gravelly voice are wasted on a blandly enigmatic entity with borrowed traits from other vengeance-seeking lone riders, whose moments of depth could be confused with being out-of-character. Rent It, and be sure to give the Gunfighter short a look while you're at it.